More Australians are considering the environmental impacts of their purchasing decisions. As a result, businesses are increasingly making environmental claims in an attempt to differentiate themselves and their products from the competition. 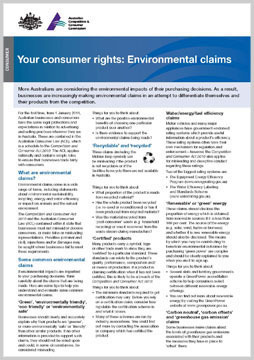 This fact sheet discusses some of the common environmental claims that are made, possible breaches of the Australian Consumer Law (ACL), by businesses making environmental claims and the role of the ACCC regarding breaches of the Act.